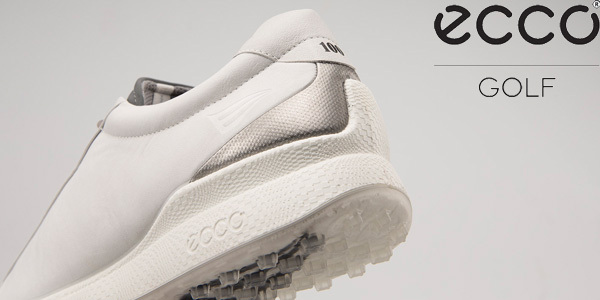 (LONDONDERRY, NH) – ECCO – a leading manufacturer of innovative footwear – announces the forthcoming release of 100 limited-edition ECCO BIOM® HYBRID CLASSIC golf shoes to commemorate Ernie Els’ 100th major championship appearance at this week’s PGA Championship. Showcasing colors chosen by The Big Easy, each shoe will be numbered from one to 100 on the heel and feature Els’ logo on the upper, sole and tongue. The limited-edition model will be available early fall at www.eccousa.com and www.tgw.com. Els will become only the 13th player in golf’s history to have competed in 100 majors, a record which includes victories at two Open Championships (’02 and ’12) and two U.S. Opens (’94 and ’97). First released in 2012 to industry acclaim, ECCO BIOM HYBRID CLASSIC showcases a completely anatomical last developed by scanning more than 2,500 feet and featuring the company’s patented, award-winning hybrid outsole. In addition to Els, ECCO Golf shoes are worn in competition around the world by Fred Couples, Smylie Kaufman, Peter Hanson, Thomas Bjørn, Lydia Ko, Minjee Lee, Caroline Masson and Gerina Piller, among others. ECCO®, a world-leading brand of shoes combining style and comfort, has built its success on great design and leather quality, and innovative technology. Founded in Denmark in 1963, ECCO is one of the few major shoe manufacturers in the world, which owns and manages every aspect of its leather and shoe productions, and its retail sales. ECCO is among the largest producers in the world of high-quality leather, which is used in ECCO’s shoes, and own production of leather goods and is also sold to several leading luxury brands. Today, ECCO products are sold in 87 countries in more than 3,300 ECCO shops and shop-in-shops, and at more than 14,000 sales points around the world. The company is family-owned and employs more than 19,000 people worldwide. ECCO USA is based in Londonderry, New Hampshire. For more information: www.eccousa.com, 800.886.3226.